The University of Maine School of Policy and International Affairs and the Maine Army National Guard will co-host a conference May 20 to 21 to explore challenges and emerging opportunities in the Arctic. The free conference, "Leadership in the High North: A Political, Military, Economic and Environmental Symposium of the Arctic Opening," will be held at the Maine Army National Guard Regional Training Institute in Bangor. Speakers will address global, national and state issues and implications related to diminished sea ice in the Arctic, including the changing environment, trade, geopolitics and policy. Scheduled speakers include: Gen. Charles Jacoby, commander of North American Aerospace Defense Command and United States Northern Command; Rear Admiral Jonathan White, oceanographer and navigator of the Navy, director of Task Force Climate Change; Paul A. Mayewski, director of the UMaine Climate Change Institute; Major-General Christopher Coates, deputy commander, Canadian Joint Operations Command, National Defence and Canadian Armed Forces; Philippe Hebert, director of Policy Development for Canadian Department of National Defence; and John Henshaw, executive director of Maine Port Authority. And officials from the U.S. Army Mountain Warfare School will share experiences and display cold-weather operations equipment. The words "emerging opportunities" jumped right out at me. 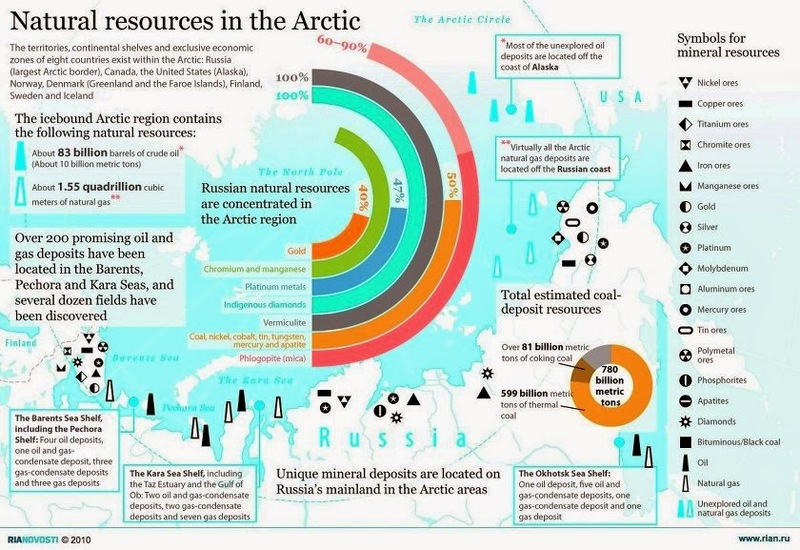 The Arctic region is loaded with oil and natural gas and with extreme melting of the ice the oil corporations are itching to get at it. But look at a map to see which country has the largest land border with the Arctic... it is Russia. Thus we see this intense US-NATO move toward militarization. In order to build public support for this new "strategic plan" they are throwing out some financial incentives - the only job creator in town anymore, the military industrial complex. America is being hollowed out and turned into a garrison state for global capital. The Pentagon has created the "US Navy Arctic Roadmap: 2014-2030". The plan includes such gems as the Navy needing ways to distribute fuel in the [Arctic] region to air and surface platforms. Fuel allocation needs to be staffed and protected which means bases will be built. How close would they be to Russia and how would that go over? The current US-NATO movement of major offensive forces along the Russian border, having used the Ukraine crisis as a pretext, helps the military more effectively "control" the Russian bear in the event of future conflict over Arctic resource extraction. "In our lifetime, what was [in effect] land and prohibitive to navigate or explore, is becoming an ocean, and we'd better understand it," noted Admiral Jonathan Greenert, chief of naval operations. "We need to be sure that our sensors, weapons and people are proficient in this part of the world," so that we can "own the undersea domain and get anywhere there." Because if the Arctic does open up for shipping, it offers a much shorter route from the Atlantic to the Pacific than through the Panama Canal, saving huge amounts of time and fuel. Our Sen. King here in Maine sent around an email called Impressions from the Arctic. He told his constituents that there has been "a 40% reduction in ice as a result of global warming" He reported that "previously inaccessible" gas and oil reserves were now going to create "new opportunities". King concluded, "I am convinced we need to increase our capacity in the region, something I intend to press upon my colleagues on the Armed Services Committee as we work on our military priorities for the coming years." King's state of Maine builds destroyers, armed with so-called "missile defense" (MD) systems that are key elements in Pentagon Global Strike planning. After a US first-strike attack is launched at China or Russia, the MD "shield" helps take out any retaliatory capability. It's a gun to the head which sometimes does not need to be fired to be effective - the threat in and of itself is bad enough. I'm sad that I couldn't get a ticket to get into the Arctic event in Bangor. Funny that a public institution like the University of Maine would limit participation. But then again I'm not surprised at all.